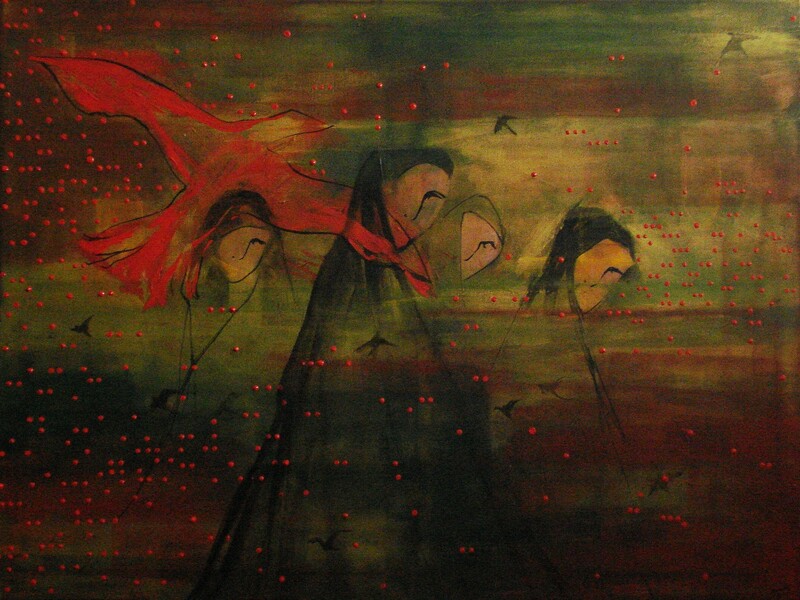 Conception of a dream, acrylics on canvas, 30″ x 40″. Breaking away from the shackles of the mind to realize what is important to you, to desire and achieve what the heart wants, free of inhibitions… a place where you can be true and ask yourself what you really want, no manipulations, no norms of society… does a place like this exist, even if it is in your dreams? Absolutely thrilled!! 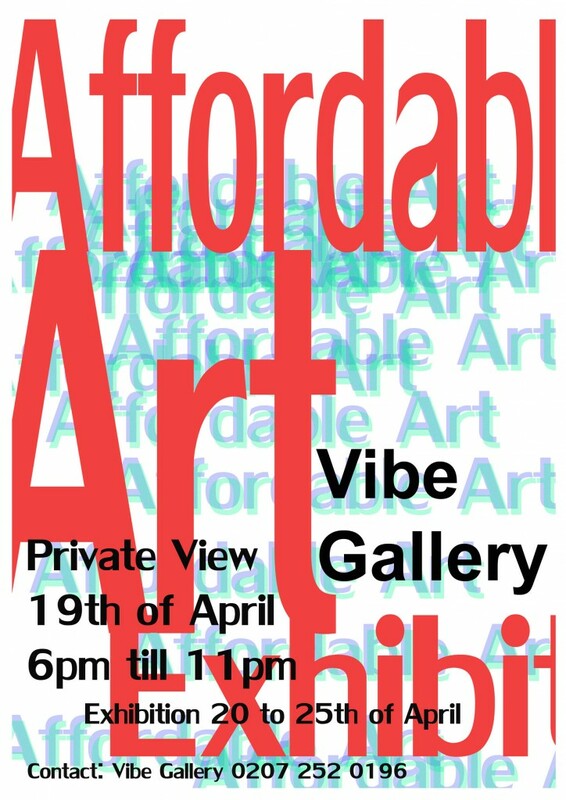 Exhibition coming up at the Vibe Gallery, Bermondsey, London. 4 new works painted this year are being displayed with the preview on 19th April and the exhibition continues till 25th April. Currently another exhibition is going on at the Higher Bridges Gallery, Enniskillen (N.Ireland), 2 of my prints have been selected to be displayed and this exhibition will be on till 7th May. 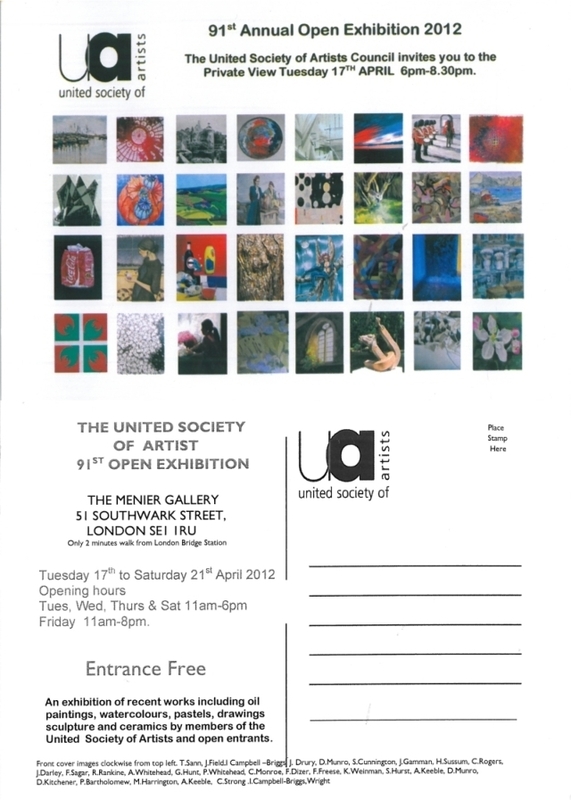 And… I have just been informed that 2 of my paintings have got selected to be displayed at the Menier Gallery, London Bridge by the United Society of Artists Council. The preview is day after tomorrow, 17th April. The exhibition will be on till 21st April. A brilliant day yesterday at the Temporary Art Fair! The venue, Tooting Tram and Social is a converted tram shed- a stunning place with high ceilings, exposed brickwork, old lit chandeliers, ornate antique frames, lovely furniture with vintage fabric- a sixties and seventies feel to the whole place. The atmosphere was perfect for an art fair and from setting up my place, soaking in the ambience, displaying my works, meeting new creative people and with a book to read (my faithful companion everywhere)- I had a great time!! The highlight of the day- sold a painting! I couldn’t help smiling on my way back home. 🙂 I have sold work before but yesterday was different. Previously, I have received payment for my works through galleries, cheques, bank transfers but to actually go somewhere and set up your area, sell your work and receive money directly from the buyer- the cash in your hands goes directly to your wallet… it’s something else! A sunday well spent, a sunday well earned. 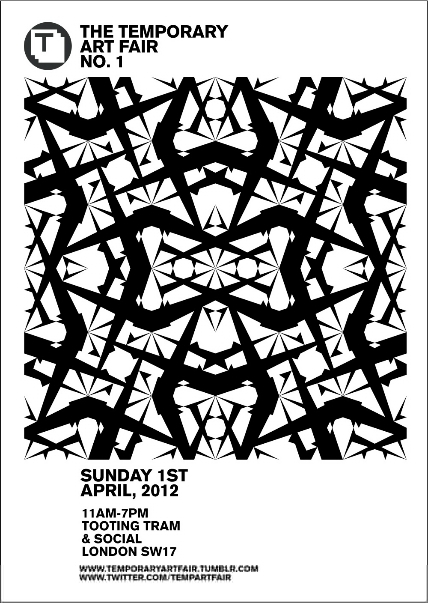 Small and medium size works of mine being displayed at this art fair in Tooting on 1st April. The fair is showing around 35 artists in a fun and informal way. There will be music all day long and entry is free, all are welcome! 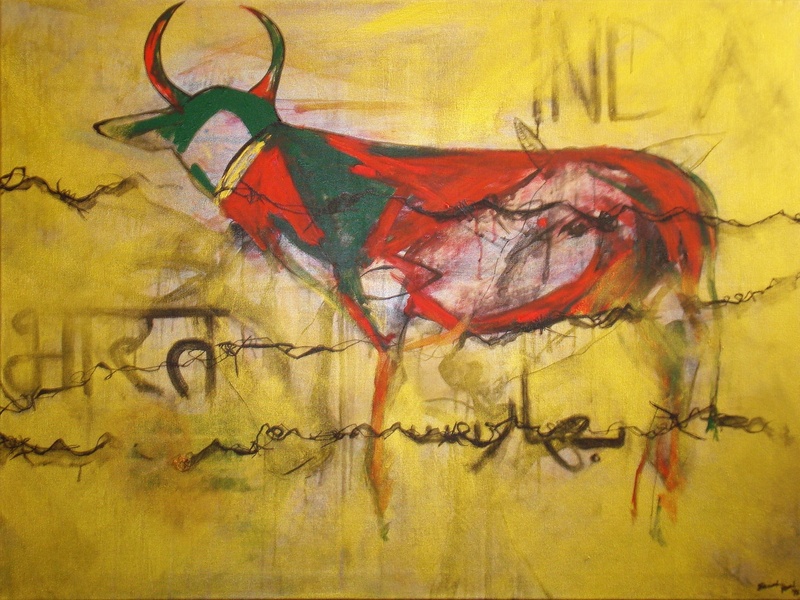 Lots of fairs and exhibitions this summer, looking forward to all (especially the Picasso & Damien Hirst ones). Also, attending Liquid Gallery’s inaugural art fair at Battersea this evening, plenty of artworks to see and meeting fellow artists. 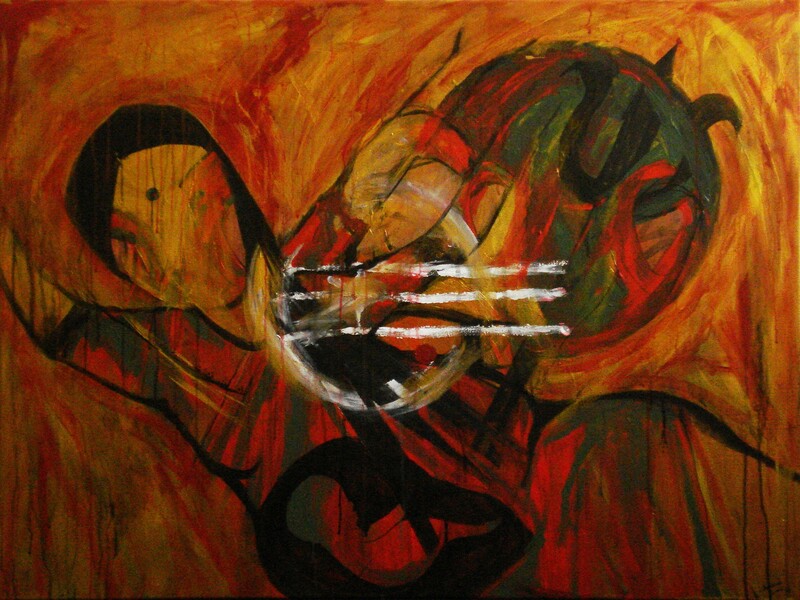 Devi (Goddess), acrylics on canvas, 30″ x 40″. From the ashes, the ‘devi’ and the unborn speak… an endeavour to cleanse the soul of the hypocrisy and hatred around us. The image is created from the heart, purest of the pure. 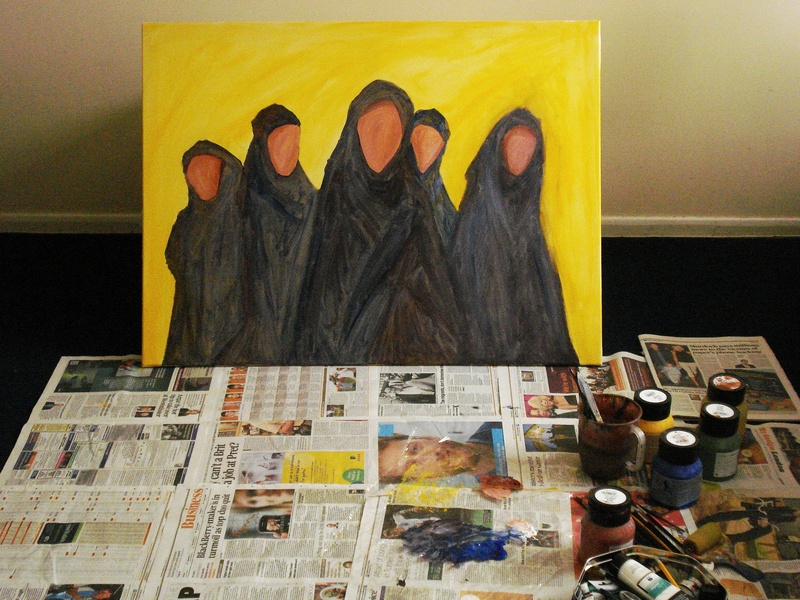 Work in progress… shall now stand back and think. My canvas changes drastically as it progresses further… so this image above may or may not remain so distinct… more work to be done, more layers need to be added. The mind wanders in different directions and from somewhere hidden deep inside you, it will bring up an idea that will change the course of your painting… very important to let the mind wander, to make it think on it’s own! I remember about 12 years back, my mother found me sitting on the bed, staring at a blank wall and asked me what I was doing and I answered “I am thinking”. At that time she scolded me saying I was wasting time by sitting idle but years later she confessed that my answer took her aback at that time and she being a creative soul herself did realize how important it was to just stand back, stare and think. 27/02/2002, a day crystal clear in my mind’s eye- the weather, the subject I studied (preparation for my A levels), the food prepared for lunch, the colour of the jumper I wore and the exact spot where I stood in the house when I saw the news on TV… it has now been 10 years since the riots broke out in Godhra, an Indian city in the state of Gujarat. I remember the train journey with my father to Bombay (2 months after the riots). There was a brief halt at Godhra station and I could see smoke charred buildings in the distance. Later that week we travelled to Baroda, another city in Gujarat and I remember someone showing us an area where shops were burnt and told us about the curfew timings… that day we also met a young man who had no remorse whatsoever for the carnage and proudly admitted that he would vote again for the same chief minister in the next elections, even though the CM and his administration did nothing to curb the rioteers. This minister, our ‘modern day Nero’ still runs the state as of today and could now be a potential prime ministerial candidate. Later in 2002, I joined art school in Bombay and for five years took innumerable train journeys back home and every single time the train halted at Godhra, the images of the burnt buildings would flash across my mind. – Kabir, 15th century Indian poet.